Not only the students studying at domestic universities, but the ones graduating from foreign schools also find it difficult to get the jobs in the banking and finance sector nowadays. 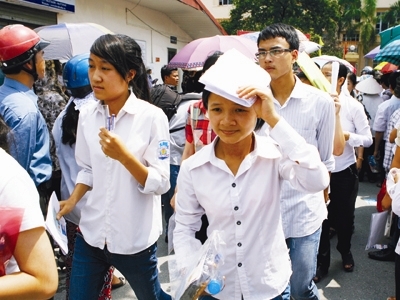 Finishing the Hanoi Foreign Trade University in 2011, one of the most reputable schools in Vietnam, Vu Duc Hai immediately got the job as a credit officer for a big bank headquartered in Hanoi. After a short time of working there, Hai resigned from the post for some personal reasons, believing that he would be able to easily find a good job when he returns to work. However, Hai was wrong. He has been refused by many commercial banks, including the small ones, even though Hai has working experience and the bachelor degree granted by a reputable school in Vietnam. “You could easily find a good job in the years 2011 and earlier, if you have a university degree and good soft skills. However, things have become quite different now,” Hai said. In general, employers would prefer the candidates who graduate from foreign universities, because they believe that the candidates have good knowledge and necessary skills they can receive from the foreign dynamic learning environments. However, even the brilliant candidates also cannot find jobs nowadays. Pham Tien Dung, who returned to Vietnam three years ago from the UK with a master degree after finishing a self-funded training course, complained that it was so difficult to find a job in Vietnam. Dung applied for a post at Vietinbank, one of the biggest commercial banks in Vietnam, but he was told that the bank did not intend to employ more workers at that moment. However, Dung was lucky enough when finding a job at Maritime Bank after six months of trying so hard to look for jobs. Dung has noted that while banks do not intend to employ new workers now in the context of economic difficulties, and some of them have even laid off workers. The number of students graduating finance and banking schools has been increasing rapidly. The oversupply of banking major students is the result of the unreasonable labor force investment policy. Some years ago, students rushed to register study at banking and finance schools after realizing the high demand in the society. Schools then also expanded the training scale in order to satisfy the increasing demand. This has certainly led to the redundancy of banking major students. Meanwhile, the problem has become more serious in the context of the economic downturn, when banks try to cut down expenses by laying off workers. Hong Han, a third year student of the HCM City Banking University, said that the banking sector has fallen into decay as the result of the bad corporate governance. Therefore, banking majoring students nowadays don’t have many job opportunities. According to To Ngoc Hung, Director of the Banking Academy, the academy enrolls 2300 students for five main training majors. This includes 1200-1400 students for the finance and banking majors. Hung has noted that due to the miscalculation, the universities, which do not specialize in finance and banking training, have also enrolled students for the majors in big quantities. The inexperienced schools still provide training services, because this can bring them more money.